Concentrated expectorant for drinking water solutions. 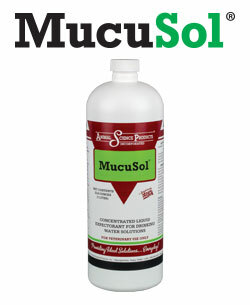 MucuSol is a liquid product developed for use in the drinking water of your poultry and swine populations as an aid in reducing respiratory congestion from mucus (phlegm). In houses with lots of dust and gas and poor quality air, animals can develop a dry cough, which is not productive – meaning it irritates the respiratory tract further instead of dislodging phlegm and expelling the irritant. MucuSol is a stable water-miscible syrup that delivers more phlegm-loosening power to eliminate the congestion during respiratory problems. Helps expel trapped irritants and infectious agents in mucus. No competitive product on the market today conveniently achieves the same level of active ingredient in the finished drinking water solution as Mucusol. So this season you can breathe easier knowing your pigs and poultry can too. For more information on Mucusol, download the spec sheet by clicking the link in the right column of this page.